As someone who works in the fashion industry as well as being a ‘Blogging Elder’, I’ve seen a lot of change in the way style and trends are consumed. Back when I started my blog in 2008, the industry worked pretty much as it has done for the last few decades with two seasonal shows for editors, buyers and VIP customers. Trends were dictated by fashion publications which then trickled to the high street and consciousness of your average consumer. Vogue was king; we listened to whatever the editors decreed whether consciously or unconsciously. The internet, or web 2.0 as we called it back then, changed everything. The birth of social media has had a profound effect on the fashion industry. Suddenly, editors and stylists like Taylor Tomasi-Hill and Katie Shillingford were rising to prominence for giving a direct and real insight into their world as well being lauded on street style blogs. Fashion shows also became immediately accessible to the public and bloggers were sitting alongside editors and buyers. Social media ushered in the democratisation of fashion. Fast forward nine years and fashion is even more accessible than ever. The industry has evolved; brands are combining menswear and womenswear, showing off-season, operating see-now-buy-now show formats and even doing away with shows altogether. At the other end of the spectrum, it’s never been easier for new brands to take off too. I wrote about the rise of the Instagram brands a couple of months ago but even brands like Manu Atelier have risen to prominence seemingly overnight, mostly due to the impact of influencers. Fashion isn’t dictated to the masses anymore. As Coco Chanel herself stated several decades ago, “Fashion is not something that exists in dresses only. Fashion is in the sky, in the street. Fashion has to do with ideas, the way we live, what is happening”. I’m more inspired by what I see on Instagram or the street than I am by the pages of Vogue…in fact, I can’t remember the last time I picked up a copy. It’s an interesting time of self-expression, style has become a melting pot of influences from art or the shows to the street. Over the last few years, my style has been fairly refined and pared back with the odd statement piece for a bit of drama – usually my heels. You might have noticed a little change in the last few months though; more sneakers and the odd streetwear brand making an appearance. Six months ago I got an exciting new job which saw me swapping a storied luxury department store with a Shoreditch-based start up. 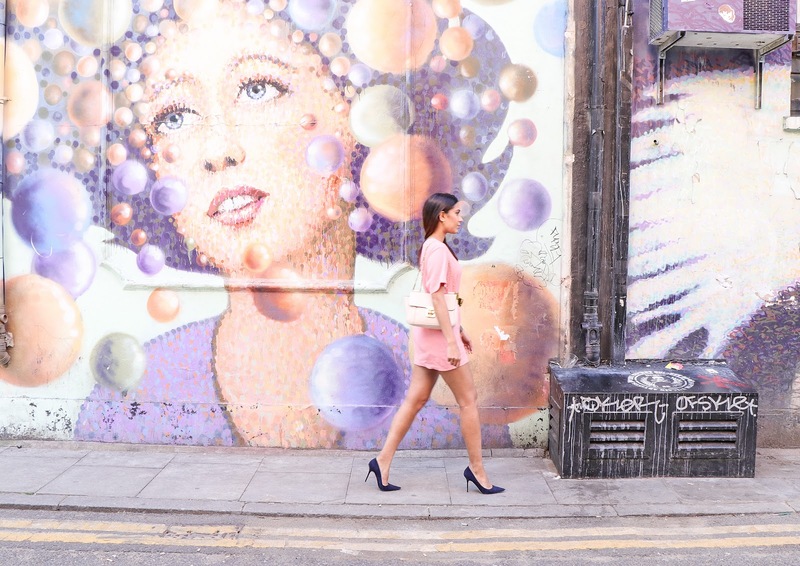 Being in a new area of London and working in a new sector of the industry has given me a renewed joie de vivre when it comes to dressing…and a lot of diverse inspiration to boot. Saint Laurent and Chanel have been replaced by Supreme, Off White and Heron Preston to name but a few of the new brands in my brand rotation. Being inspired by new influences is super exciting but rather than adopting a whole new aesthetic, I’ve simply peppered these elements into my look. Whether I’m throwing on a Palace tee with some shorts and Nicholas Kirkwood heels or belting an oversized Supreme tee and slipping on a pair of Jimmy Choos (like in this look), being true to my own style is the most important thing to me. No matter what influences you, authenticity is the most important thing to convey. How you dress tells a story to the world, wouldn’t you want your story to be about you?